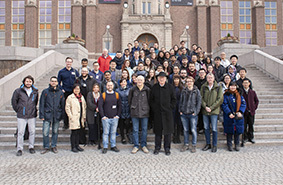 Dr. Evgeny Alexandrov and Prof. Davide Proserpio held a series of workshops and lectures for the participants of the “School on Reticular Chemistry: description and design of framework materials”, which was held from March 27 to April 2 at Stockholm University (Sweden). The event is timed to the Aminoff Prize award to Prof. Michael O'Keeffe (Arizona State University, USA) and Prof. Omar Yaghi (University of California, Berkeley, USA) "for their fundamental contributions to the development of reticular chemistry." This is the second school organized in Stockholm, the first one was held in 2012. It aroused even more interest in the scientific community, thusinstead of the planned 55 participants, more than 70 PhD-students, postdocs and young researchers from 15 countries took part in the school. All of them were interested in learning how to describe the topology of the structures of advance framework materials, such as zeolites, metal-organic frameworks (MOF) and covalent organic frameworks (COF). The teaching staff included Prof. Michael O’Keeffe, Prof. Davide Proserpio (University of Milan, Italy), Prof. Omar Yaghi and Dr. Evgeny Alexandrov. Lectures were devoted to topological methods for describing the structure (basics of graph theory, building tilings and periodic nets), reticular chemistry, and design of framework materials. The program included workshops where participants gained skills in working with free software for analyzing structural information, including ToposPro, Systre and 3dt.